Raining today and it probably won't let up all day so no visit to the fishing park. Here's the plan for tomorrow, weather permitting: Off to BoSang Fishing Park. I'll bring some scales and we'll weigh each fish we catch. I want to see if we can break the 200lb mark. Two days ago we caught 10 fish and I reckon each weighed an average of 20lbs, some bigger, some smaller. Hopefully we can show you the weighing and releasing of each fish we get. Watch this space. Sunday will probably be a day off fishing and then we're off to Pai Piranha Fishing Park for 3 days. 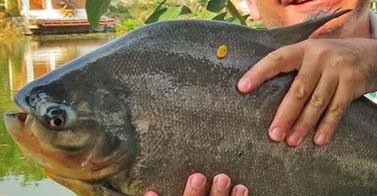 Note, we won't be catching any "piranha" fish...the species in question is the Pacu which while it does have a piranha like appearance and is an Amazon basin native is actually not related to its fearsome lookalike. The pacu is a mainly vegetarian fish but does also eat small fish, shrimps etc. It does have fearsome dentistry which is uses to crack open fallen nuts. There are also anecdotal incidents of its attraction to human testicles although I personally will not be testing this theory at any time. Above are variants of the laptop computer I have been using on our Thailand fishing adventure. ACER produces a great product at very reasonable prices. My own ACER is the V5 with Intel i7 processor and integrated graphics. It has a 1TB Drive, 8 gigs of RAM and a 15.6 inch screen. It has proven itself more than quick enough to handle the (admittedly amateurish) video editing you see on this blog. Any video editing puts a strain on slower machines and many budget computers can't handle it. Photos, web browsing, blogging etc. are no sweat for this machine. Highly recommended, no complaints yet!